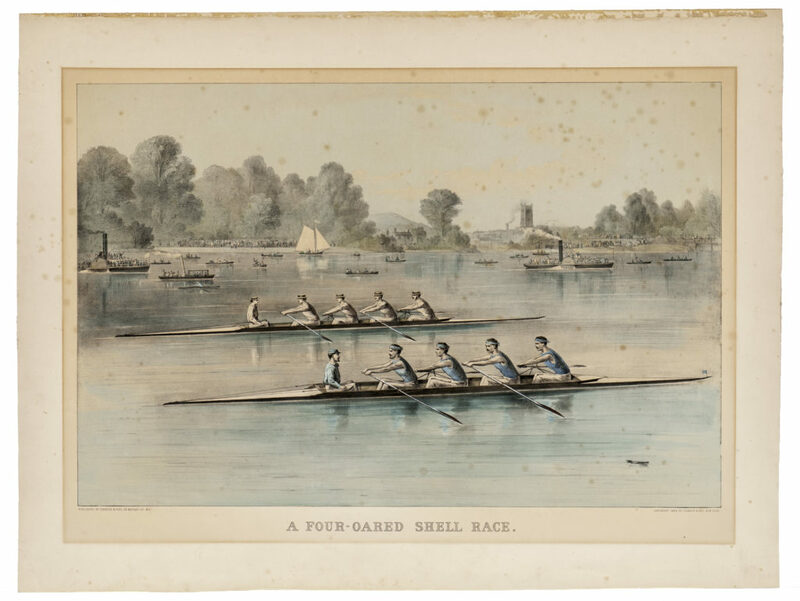 Currier and Ives: America Envisioned | Skinner Inc.
A Four-Oared Shell Race, 1884. Auction 3120T, Lot 1458. Sold for $10,455. Large size (18 ½ x 28 inches) and subject, a Harvard-Yale race, drove the high price. Nathaniel Currier, an enterprising young printer in New York City, produced a lithograph of a raging fire in the New York Merchant’s Exchange in 1835. Thousands of copies were sold in just a few days, and Currier realized that dramatic illustrations of newsworthy events could be popular and profitable. He soon became an independent print publisher. James Merritt Ives, Currier’s bookkeeper and accountant, became his partner in 1857. They developed a business based on subject matter ranging from current events to political satire and sentimental genre scenes. The partners remained highly successful image-makers of the American scene for fifty years. Currier and Ives published over 7,000 different images. Almost all the originals were hand-colored lithographs. Occasionally an uncolored print was issued, and since almost all reproductions are colored, uncolored examples are likely to be originals and quite scarce. Most Currier and Ives lithographs were printed in large quantities, with hundreds of examples of the most popular images, so “rarity” is a relative term. In addition, reproductions and re-strikes (copies made from the original lithographic stones) abound. Copies greatly outnumber originals, and they have much less value. Sizes of genuine prints vary slightly but generally fall into three groups: Small folio, around 8 x 12 ½ inches; Medium folio, 10 x 14 up to 14 x 20; Large folio, over 14 x 20. Some of the smaller sizes and larger runs were colored using stencils, while the largest and most expensive prints were more carefully executed and colored entirely by hand. 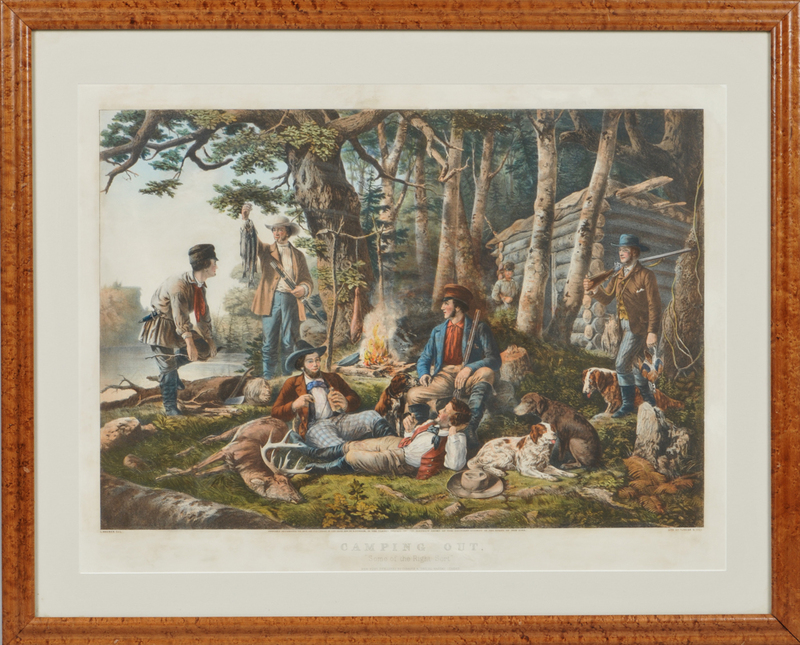 Currier & Ives, Publishers (American, 1857-1907) Lithograph Camping Out, 1856. Auction 3038B, Lot 645. Sold for: $923. 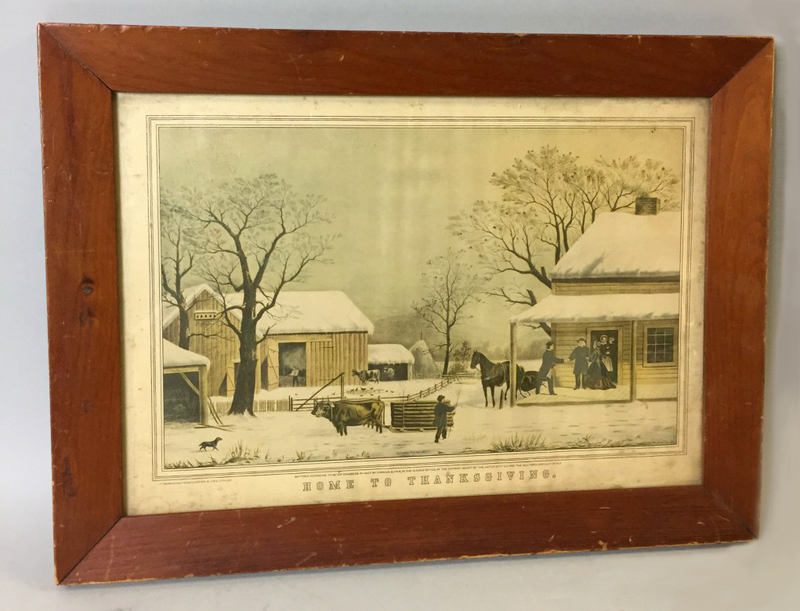 Buyers and sellers want to know: is this an original Currier and Ives that may be worth hundreds, and in some cases thousands of dollars (at the time of publication, small prints sold for five cents)? Or is this a decorative reprint worth less than the price of a cup of coffee? The first elimination round is straightforward. Reproductions often show printed matter, such as a copyright notice, or wording such as “Reproduced from,” sure signs that the print is not an original. Round two: Most reproductions were printed with the dot matrix process. Under a good magnifying glass, the ink is visible as distinct small dots rather than a smooth unbroken surface. By contrast, the color on the originals is solid paint, brushed on by hand. Round three: Usually, reproductions were printed on thin, and sometimes glossy, paper. Originals were printed on thick wove paper, a smooth clothlike paper without ribs or watermarks. What about prints that pass these simple tests of authenticity? It requires specialized expertise to distinguish a genuine Currier & Ives from high-quality copies that, while less valuable than the originals, can be worth hundreds of dollars. Re-strikes are prints made from the original stones, some of which were sold to other companies after Currier & Ives went out of business in 1907. These prints are now old and fairly rare and have a greater value than more recent reproductions. There are also some high-quality reproductions that can only be detected by an expert. The best-known of these are the twenty large-folio prints issued in 1942 by Andres Inc. of New York. Home to Thanksgiving, reproduction, auction value $10-15. If a print is a genuine original, value depends on a number of factors. Size matters, with the largest examples having greater scarcity and greater value. Condition is important; some toning is to be expected, but badly faded prints or examples whose margins have been greatly reduced are less desirable. Subject matter counts too. Dramatic sporting events, major historical figures and episodes, and nostalgic winter scenes fetch higher prices. Attractive, affordable, and approachable, Currier and Ives prints remain at the pinnacle of popular Americana because of their enduring graphic appeal and historic interest. This entry was posted in Blog and tagged art prints, Currier and Ives, Fine Prints, lithographs, original print, reproduction by Kerry Shrives. Bookmark the permalink.